Fire Damage Inspection Checklist: Don't Leave These Out! What Does a Thorough Fire Damage Inspection Include? As traumatic as it is, fire can cause more damage than we can actually see. Fire damage can extend to the structural elements of a building, such as the foundation and roof, so it’s necessary to have a fire damage inspection done professionally. Surprisingly, a number of homeowners would disregard the necessity of a thorough inspection. Perhaps they wonder if their insurance provider will cover restoration work such as mold, smoke or odor removal. The truth is, you mustn’t settle for a half-done restoration job since your standard insurance policy protects you and your property. 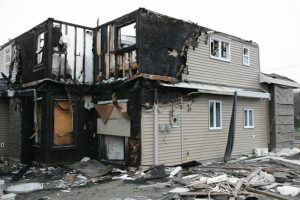 Here’s what a thorough fire damage inspection involves. In the event of a fire, burning embers may destabilize the roof structure due to excessive heat. After the fire is put out, an expert should also check if the wood underneath the roofing material is water-stained, and therefore, whether there is a danger of mold development. Apart from having aesthetic values, stucco finish is vital in protecting concrete block masonry from external factors. Therefore, it should be thoroughly inspected after a fire. It may spall and crack because of dehydration and baking. When it comes to siding, it can melt after being exposed to heat. What’s more, there is a risk of mold developing underneath after the fire is extinguished. Perhaps most importantly, it’s essential to check the anchored foundation, as it can get severely damaged by heat. Concrete core sampling and x-ray testing may be necessary. Due to the transfer of heat by steel/iron structures, the foundation can be greatly destabilized and needs a careful inspection. In order to conduct a thorough inspection, your contractor has to look for any signs of mold or destabilization of the internal structure. That may involve opening up internal walls to establish if there was any damage to the framing. This is as important as the inspection of the foundation; if not addressed, these issues can compromise the safety of the whole building. All piping and ducts have to be checked for signs of damage. Additionally, they require thorough cleaning so you can make sure the health of the residents will not be compromised once they return to the premises. The damage to the windows is easily observable since there’s bound to be some discoloration. In severe fires, window frames may even melt. Glass can also get warped or discolored. Even if the issue seems small compared to other seemingly bigger ones, warped windows may cause the development of mold. Even though a thorough fire damage inspection is a must in all cases, it’s vital in cases when there are residents with respiratory problems, such as asthma. Mold and soot residue are dangerous enough, but even more so to asthma patients. Don’t risk the health and safety of your family – always hire a licensed fire restoration contractor to conduct the inspection. Full-service contractors such as KIC Restoration can provide not only targeted reconstruction and cleaning but also assist you in preparing for the evaluation your insurance provider will carry out. You can reach us 24/7 – we will take action immediately after your distress call.